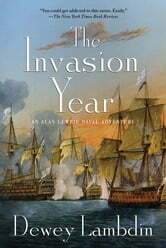 The Invasion Year is the seventeenth tale in Dewey Lambdin's smashing naval adventure series. 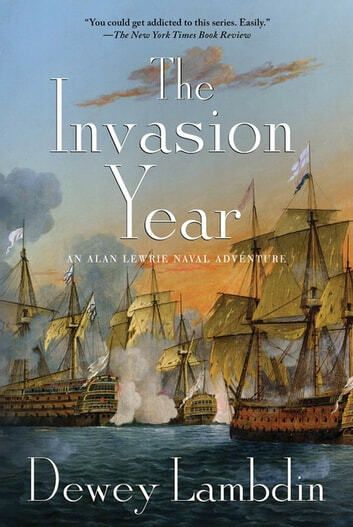 For a fellow like Captain Alan Lewrie, Royal Navy, who despises the French worse than the Devil hates Holy Water, it's hellish-hard to gain a reputation for saving them, not once but twice, when the French refugees from Haiti surrender to England rather than the vengeful ex-slave armies in November of 1803! After that, it could be "all claret and cruising" in the Caribbean, but for a home-bound sugar convoy, one so frustrating as to make even the happy-go-lucky Alan Lewrie tear his hair out, kick furniture, and curse like . . . well, like a sailor! Back in England for the first time in two years, there are honors from the Crown for gallant service . . . a lot more than he expected from King George III, who was having a bad morning, then a chance to move in Society after an introduction to an intriguing daughter of a peer. But then come secret orders to experiment with several types of "infernal engines of war," which might delay or postpone the dreaded cross-Channel invasion by Napoleon Bonaparte, his huge army, and his thousands of invasion craft. For the rest of 1804, Alan Lewrie and his crew of the Reliant frigate will deal with things more dangerous to them than they may prove to be to the French!